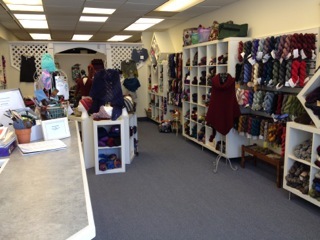 The final shop we have to spotlight is The Knitting Garden (631-923-3222) at 49 Green Street in Huntington. – Facebook That is all the store specials happening yarn crawl weekend so you can plan your stops. We look forward to see you out and about next weekend visiting as many stores as you can. Have a great time! The Knitting Garden, located in Huntington Village, is a friendly neighborhood shop. We encourage you to stop by to work on your project, browse, and be inspired by the gorgeous and ever-changing selection of yarns. Meet up with old friends or make new ones around our work table. Whether you are an expert knitter/crocheter or a novice, you are always welcome at The Knitting Garden. Joann Esposito, the owner of the Knitting Garden, has created a warm atmosphere for her clientele. Some of the best compliments an owner can receive is how friendly and welcoming a store is and here at the Knitting Garden that is heard often. We offer many classes & workshops at The Knitting Garden, including our very popular Square of the Month Club, shawls, hats, socks, scarves and Fair Isle!! Every Tuesday evening is our Knit night. Plan to join us soon! The Knitting Garden will be offering a sale on all Rowan yarns between 20 – 40% off. 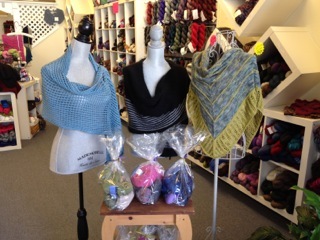 Special shawl kits are in the works at a 20% discount, you will have to stop in to see.